Compare to the non ruling by the same court in Ernst vs AER, where the court knowingly defamed Ernst and allowed Alberta’s energy regulator (AER) to get away with violating Ernst’s Charter rights (her “valid” Charter claim was not quashed by the court, but it disallowed Ernst her guaranteed right to seek remedy for the violations). The court used harms done to Ernst by the AER to set precedent for governments – federal and provincial, and their agencies (like energy regulators), to get away with violating Charter rights of citizens harmed by corporate pollution. The court violated the very Charter that is supposed to protect Canadians from abusive governments and their abusive agencies. An independent commission came up with a recommended land use plan for Yukon’s pristine Peel watershed region in 2011. The territorial government then came up with its own plan, which would have opened more of the region to development. First Nations and environmental groups cried foul. The Supreme Court of Canada has ruled in favour of Yukon First Nations in their fight to protect the Peel watershed region, overturning a decision that rolled back years of planning and ordering the government to consider a final recommended plan proposed by an independent commission. The unanimous ruling released Friday ends a five-year legal battle [December 3, 2017, Ernst enters her 11th year in her lawsuit against Encana and the Alberta government. Because it’s oil and gas industry pollution, Encana is guaranteed protection and so is it’s pollution enabler, the Alberta government, while the courts make sure Ernst is never allowed access into Canada’s Boy Club legal system] between the Yukon government and a group of First Nations and environmental groups. The case was fought in territorial courts before the First Nations and environmental groups appealed to the country’s highest court. A Supreme Court hearing was held in Ottawa in March. In the ruling Friday, written by Justice Andromache Karakatsanis, the court upheld a ruling by a trial judge to quash the territorial government’s final land use plan, ordering the planning process to resume at an earlier stage. Changes made by the territorial government’s land use plan “did not respect the Chapter 11 process,” the decision reads. “Respect for this process is especially important where, as here, the planning area includes First Nations’ traditional territories within non-settlement areas. The dispute has centred on Yukon’s land use planning process for the Peel watershed and what happens when a government fails in its treaty obligations. The Peel watershed is a roughly 68,000-square-kilometre swath of pristine sub-Arctic wilderness that represents about 16 per cent of Yukon. It’s larger than Nova Scotia. In 2011, after years of work, an independent commission came up with a final recommended land use plan for the Peel region. It would have protected about 80 per cent of the region from development. The Yukon government didn’t like that idea, and in 2012 it presented its own plan, which would have protected just 30 per cent of the region. Local First Nations and environmental groups cried foul, and took the government to court. They argued the territorial government had breached its treaty obligations under Yukon’s Umbrella Final Agreement (UFA), which was signed by First Nations and the territorial government in 1990. It describes a collaborative process for land use planning. 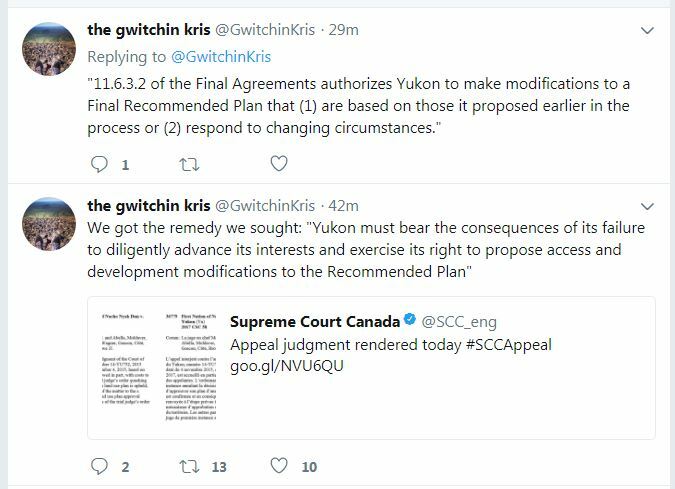 The lower courts agreed that the Yukon government derailed that process by ignoring the commission’s recommended plan in favour of its own. The Supreme Court agreed with that assessment Friday, returning the process to when the commission’s final recommended plan was first presented to the government — an option favoured by First Nations and environmental groups. The government sought to return the process to where input from all stakeholders is considered, essentially restarting land use planning for the watershed. Friday’s decision has been highly anticipated in Yukon, where the dispute became a flashpoint for government-First Nations relations in recent years. Yukon government lawyers argued the Peel planning process should go back to where input from all stakeholders is considered. But the First Nations and environmental groups wanted the commission’s final recommended plan from 2011 to stand, allowing the government only minor modifications — something Gordon Christie, a law professor at the University of British Columbia, also favours. “A lot of people have pointed out that giving the Yukon government the opportunity to redo the whole thing doesn’t seem appropriate — it doesn’t seem it fits with issues of reconciliation,” he said. Christie says Friday’s ruling will have “far-reaching consequences” beyond Yukon. He says it’s about how modern treaties — many of them in Canada’s North — are honoured and implemented. Yukon’s mistake was in ignoring what’s clearly spelled out in the UFA, he says. “There’s supposed to be some collaborative process of decision making, and we need to see that upheld by the court,” Christie said. Representatives from the Tr’ondëk Hwëch’in, Na-Cho Nyäk Dün, and Vuntut Gwitchin First Nations, as well as the Canadian Parks and Wilderness Society and the Yukon Conservation Society, have planned a news conference on Parliament Hill on Friday afternoon to discuss the top court’s decision. The event will be live streamed at the Kwanlin Dün Cultural Centre in Whitehorse, beginning at 10 a.m. PT. However, First Nations leaders said it is critical that the court requires the government to follow the procedures laid out under treaties. Chief Joseph said her people made significant concessions during the treaty negotiation in order to win the right to jointly manage land use of their traditional territory and were determined to protect that process. The Supreme Court decision makes it clear that governments need to adhere in good faith to processes set up by treaties. [But screw Canada’s Charter rights for ordinary non First Nations civil Canadians] The Yukon governments conceded at the trial stage that it had not done so but wanted what the First Nations and environmental groups described as a “do over” of the entire process reach the conclusion it had wanted. The dispute arose after Yukon First Nations and the territorial government in 2004 set up a land use commission to govern the Peel Watershed, as required by treaty. First Nations initially wanted the watershed to be completely off limits to resource development, but eventually agreed to recommend in 2009 that 55 per cent of it be fully protected and another 25 per cent have interim protection, with a permanent settlement to be concluded in future years. At that point, the Yukon government indicated it wanted a “more balanced” plan to allow for more development, but it did not propose specific modifications. Two years later, the commission issued its final report, sticking with its initial recommendation. At that point, the government said it was “modifying” the recommendation – as permitted under the process. However, its proposal amounted to a wholesale reversal of the recommendation, ruling instead that 70 per cent of the watershed would be open to development. “By proceeding in this manner, Yukon ‘usurped the planning process and the role of the commission’,” Madame Justice Andromache Karakatsanis said reasons, quoting the trial judge. As a result, she wrote, “Yukon’s conduct was not becoming the honour of the Crown,” the test the court has established in cases involving Indigenous rights. The Supreme Court of Canada on Friday ordered the Yukon government to abide by a commission’s recommended plan to preserve a vast wilderness area in the Peel Watershed, handing a victory to First Nations communities in the territory. It’s not a long decision, as Supreme Court rulings go: 64 paragraphs. Like all Supreme Court decisions, it comes with a summary prepared by the court itself.